This interview took place on: January 17, 2013. JFH (Michael Weaver): For our readers who aren't aware, can you touch on the reasoning for the change from going by simply your name to an actual band name -- Love and Death? Brian "Head" Welch: I left the band Korn in '05. I did a solo record and put it out three years later and then I hit the road and hired a band to go with me. Well, I got connected with the guys so much on the road that I decided to -- we all decided together -- to just put our new project out as a band name and not just me as a solo artist. So, that's how it came together. These guys had a lot of input and a lot of great ideas for the new record (that comes out next week). So it's totally, totally a group effort. JFH (Michael): That's cool, man. It's good to know that it's not all about the one, but about the group. It's nice to hear. Brian: I think you get more great ideas when other people are putting their stuff in, and I love it. JFH (Michael): I agree. Speaking of the new record… The music you are releasing this time around is a little more melodic. It's still heavy, but overall maybe a touch more accessible. Was this a predetermined mindset for you, or just simply a product that came out of the writing process? Brian: It was definitely something that I wanted to do. That's not to say… Let's just put it this way: The new record has everything that I love about music, whether it sells a lot or a little bit. The melody … I'm a melody guy; I love melody. I wanted to write good, quality songs and our producer helped us do that. I'm just really pleased with the good balance of everything. It's able to hit a broader audience, I think, and that's what we were going for definitely. I'm happy with the finished product. JFH (Michael): I think it sounds good and I think this time around -- with a little change up in the music and doing some things you really like -- you've really taken the reins and grasped ahold of that lead singer role. I think it came out really good. Is that what you're thinking too? Brian: Dude, thank you so much. I've noticed a growth, but that's been my biggest struggle this whole time: Stepping into that role. A lot of times I've thought, "Wow, do I really want this role?" *laughter* I know that I'm called to do it. I know that it's a meant-to-be type of thing, so I just kept pushing; I've developed the strength in my voice better. I don't think I'm where I want to be, but I'm a lot better. So I'm pleased with where it's at, yeah. I look forward to growing more in that aspect too. JFH (Michael): That's good to hear. It turned out really well, and it's definitely completely your own, but I have to ask, why cover "Whip It?" Was it just a song you really liked, or was it something a little more personal than that? Brian: *laughs* Well, I was looking for a cover tune to put on the album. Actually, we put out an EP, our first release, last April. It was the first Love and Death EP just to get the name floating around. My manager had the idea of putting a cover song on there just to give the fans something else that they'll get off of it and I was like, "Cool." So, he sent me a tune from the band The Used; they did "Burning Down the House" by Talking Heads. So, I listened to it and I was like, "Oh, that would be cool to do a new wave song." I wasn't sold on it exactly. I didn't have to do a new wave song, but I thought it was a good idea. So, I found DEVO and I just remember them being the weirdest band on MTV when I was a kid. [JFH (Michael): Yeah, definitely] So, I found a way to do it [in a way where] our song doesn't sound like "Whip It." I found a way to do it in our own version which is really fun. It's really fun live too. JFH (Michael): When I got the EP originally, I had no clue -- the first time I listened to it -- that it was actually a cover. I kept hearing the "whip it" part in the chorus and was like, "What?" I started paying attention and all of the lyrics were there, but it was just completely different. I like how you guys grabbed ahold of it and made it completely your own. JFH (Michael): *laughs* Speaking of songs… Like I said earlier, the entire album really sounds good, but the song that stands out to me more than anything is "By the Way." Can you tell me a little bit about that song? Brian: Oh yeah, man. That's a really deep one for me because I lost two old friends that I hung out with a lot back in the day. I hadn't seen them a whole lot up to this last year, but one died from a heroin overdose and the other one from cancer. It just hit me and it was really on my soul for a long time back in the summer. So when we wrote that song I was like, "It's gotta be about [them]." I was feeling how I was feeling and I hadn't seen them in so long and I was thinking about their close family and friends. I kinda got into their heads and their hearts. I haven't really experienced someone very, very close to me passing way, so I just kinda thought about what that would feel like and I came up with lyrics; just really deep lyrics. Also, I had a guy help me some of the verses and stuff and so we came up with that. It's just about grieving a loved one and just trying to figure out how to go on, you know? JFH (Michael): Just listening to it sounds deep. Its sounds personal. It sounds emotional. Maybe those reasons are why it stands out to me among the other ones. As I told you, I like the whole album, but that song REALLY stood out to me. JFH (Michael): *laughs* It has a good sound. I also really like "W8 4 U." Brian: Yeah, yeah. Mattie Montgomery [from For Today], our buddy... I love that song too. It came out really good. JFH (Michael): A little a bit more on the songs… You had a top-notch production team with Jasen Rauch, Ben Grosse, and Jim Monti. You also added Paul Pavao and Lee Bridges. How did working with this crew of guys help to really mold the sound of Between Here and Lost? Brian: That team… Oh my gosh, the production team and the mixing team is the best I've had since back in the Korn days. So, I'm on cloud 9 just to have Ben Grosse and his hand in the mix and Paul is right under Ben Grosse, so he was helping us. Jasen Rauch wrote on the record; he produced, he programmed the sounds on the record -- like in the DEVO stuff and all the songs. He helped with the naming -- He named the "Chemicals" track. I look forward to working with him many, many more times in my life before I'm done with music. But, yeah, [I feel] very blessed, man. JFH (Michael): They did a good job. Too often production becomes "over produced" and that gets annoying when you're listening to new stuff, but I don't really think this came across that way. Brian: Yeah, I think he had a good balance of that real raw, crunchy guitar and with the new sounds, as far as the programming and stuff. I think he's really got a good head in the game about just keeping a good balance of everything, you know? I trust him majorly with that stuff. JFH (Michael): I think you made a good choice. JFH (Michael): On my side, sitting and looking bac, I'm thinking you had to have had your pick in just about any label. I'm just curious: What drew you to Tooth and Nail? Brian: Well, rock music is just difficult right now in general, and people know that I found Christ and everything, and that makes it even harder. You know, anything about Jesus and people act weird. We were talking to three labels, too. We were talking to Tooth and Nail, plus these two others and, I don't know, we had certain terms that we wanted. We wanted someone to really get behind us and try to push it and Tooth and Nail stepped up a little more than the other labels. They promised things on promotion and stuff that they would do to really push the record. That told us right there that they were willing to step out and do a little bit more. So, we thought that was the sign that we needed that they stood out above the rest. The others were cool too, but a couple things we asked them about they were like, "No. Yeah, we can't really do that, but we'll be happy to work with you, but we can't really do that," and Tooth and Nail was like, "Yeah, we can do that… AND this and that." It really worked out well. JFH (Michael): It was pretty cool to see. Growing up, when I was consuming all of this music in my younger days, most of my favorite bands were on that label. [Brian: Oh really?] It's kinda neat to see some new people coming in. Brian: Yeah, they're doing good, man. They're doing good. They have a big range of stuff going on over there. With people talking and stuff, I've heard really good stories and I've heard some people that are bitter and not good stories. I think Tooth and Nail has a good track record as far as the longevity. They've been around for a long time and they've worked with a lot of bands. They're doing something right because they're still here, you know? JFH (Michael): I get what you're saying as far as some of the bitterness, but it seems like any band that's left on bad terms ended up coming back to Tooth and Nail before it was over. Brian: Well, that says something there too, huh? Why go back to something that's not good for you? I think, like anything, we're dealing with humans here so people won't see eye-to-eye on every issue. And you're dealing with these musicians that are putting everything into their records and if their dreams aren't coming true, then people gotta point the finger somewhere. It's all been good for us. JFH (Michael): That's good to hear. Love and Death is about to embark on a pretty diverse tour next month. This is kind of a two part question: Have you met any of the other bands yet and how do you think this tour is going to go with a whole different style for each band. JFH (Michael): *laughs* The only disappointing part for me is that you guys aren't coming to Florida. Brian: Man, you know what? I've been trying to go to Florida for like two years! I've been talking to people on Facebook and I don't know why. I don't know if it's a lack of clubs or what. I've never been to Florida with Red. I've never been to Florida with P.O.D. We get real close over at Atlanta, but that's as far as we go. It's weird. JFH (Michael): Moving away from the band a little bit. Your "I Am Second" spot is still one of the most hard-hitting and popular ones out there. Are you still doing any work with that ministry? Brian: I do stuff when I can. They do the fundraising stuff in different cities and I like to go with other -- they call them "Seconds." I get together with other Seconds and help out. As far as anything else, I think the videos just speak for themselves; there's just not a whole lot going on. The last couple of years, we've gotten together, like once a year, in the headquarters in Dallas and done events and stuff like that. If anything comes up I'm usually there because I've become friends with the I Am Second people; I've been with them since the beginning back in 2008. JFH (Michael): I think it's a really good thing they're doing. It's simple, but it's powerful. I checked out the I Am Second book and I bought my friend the devotional for Christmas. I'm thinking of checking out your devotional, though. Brian: Oh, Stronger? Cool, man. Thanks for checking it out. I poured my heart into those books. I think I'm going to be doing some kind of book again in the future. Maybe later though, because music is really busy right now, but I'm telling you: Music is cool, and I do the music, but when I start talking about Jesus, whether in a book or live or anything, that's when I start coming alive. That's my favorite thing. JFH (Michael): That's awesome. Just curious; this is something I've always wondered about, but haven't heard too much about it. Since leaving Korn, have you stayed in touch with the other guys at all? Brian: Not really, up until recently. Last year, back in 2012, I hung out with them and actually played one song at their show. It was a big 'ole show. 50,000 people... They asked me to play one song, a song that I actually play in my set with Love and Death. I was like, "Alright." They asked me like 10 minutes before stage. I was just hanging out and all of a sudden they asked me and I'm like, "*hesitant* Alright." I was all nervous with 50,000 people, but it was just like old times. I went out and did it. All these people were out there -- it's called "Carolina Rebellion". It was cool just to show up. It makes a statement when you just hang around with people, you know? So, I've been connected with them a little bit, yeah. JFH (Michael): That's good. I knew there was a lot of bitterness and anger from fans and I didn't know how the band took that, or did they just back away for awhile? Brian: Yeah, we both backed away. I was like, "I don't want nothing to do with them for a long time." JFH (Michael): That makes sense. You were trying to get away from a certain lifestyle and you have to separate from certain people to do that. JFH (Michael): Well, 7 years away from it, everyone knows by now that you're for real. This wasn't some little thing just to make a scene; you're for real. You're about God and you're sold out to Him. Now going back gives you a chance to witness to them and let them see that this is real; this was a real thing that happened. Brian: Totally, totally. I'm a new bloomin' person and people are going to see that and it's going to be good. To whatever degree it's meant to be, God loves everybody. That's all I know. He wants us to go where the people He loves are and not be all hung up on the issues of their lives. So what if they're not living like I am, you know? There's a lot of unconditional love from God for those people. He sends people in to hang out with them and just be with them, you know? He does it all the time. JFH (Michael): Is there anything in particular that you'd say God's been doing in your life right now? Anything you'd like to share with us? Brian: All kinds of stuff. I finally, last year, got rid of all my rage. I'd battle with it and it was like a monster in me that would just manifest a couple of times a year. I would just rage and go into fits and just lose my mind a little bit and have a meltdown -- Like the song "Meltdown" *laughter* And finally, in 2012, it just got taken out of me and I haven't had to deal with it since. I know it's gone because I've had major trials, situations, and tribulations that would have brought that out in me and I was way better. I was way better. JFH (Michael): He'll give us what we ask for. If you were looking to be rid of it, I definitely think it's something He would do. Brian: Hey, Mike, I'm with my friend who gives me the worst trials in my life right now and I'm doing pretty good. *Michael laughs* I'm on Huntington Beach right now. JFH (Michael): Are there any final thoughts you want to leave us with? 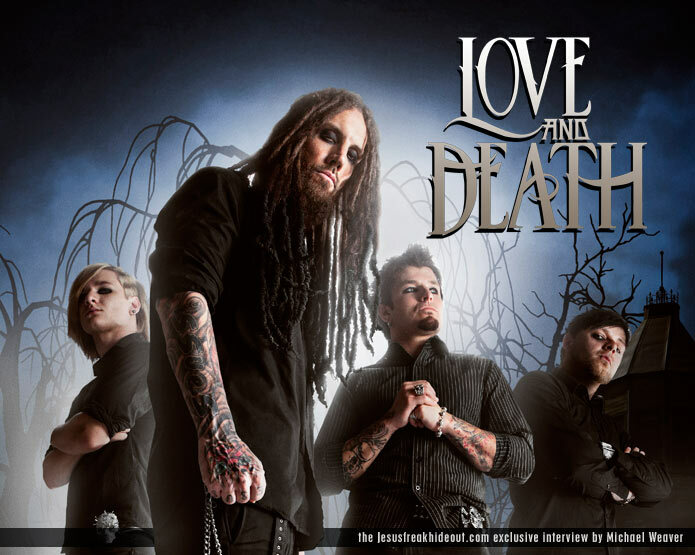 Love and Death's full-length debut album, Between Here and Lost will be available wherever music is sold January 22, 2013!